1. Successful operation of year-around stations continued to be demonstrated at the three TAMDEF sites, Cape Roberts, Mt. Fleming and Fishtail Point, which are located in the Trans-Antarctic Mountains. All three continuous stations were installed and maintained by G079 (TAMDEF) and UNAVCO during previous seasons. These stations were visited during the 2006-2007 season. Data retrieval from Cape Roberts and Mt. Fleming is through the Truncated Cones repeater site on Mt. Erebus. Data are downloaded daily and delivered directly to the UNAVCO data archive. 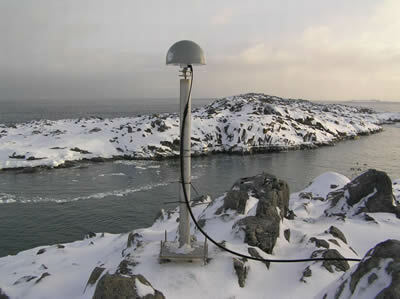 The repeater, installed during the 2004-2005 season, was damaged during a major winter storm on June 1, 2006, with winds in excess of 275 km h-1. A new repeater antenna with extra support was installed during the 2006-2007 (Figure 1). Additionally batteries were installed for the repeater radio. 2. The Palmer GPS base station was upgraded to a new system that both meets the U.S. Geological Survey (USGS) data requirements and is standardized for UNAVCO operation and maintenance support (Figure 2). 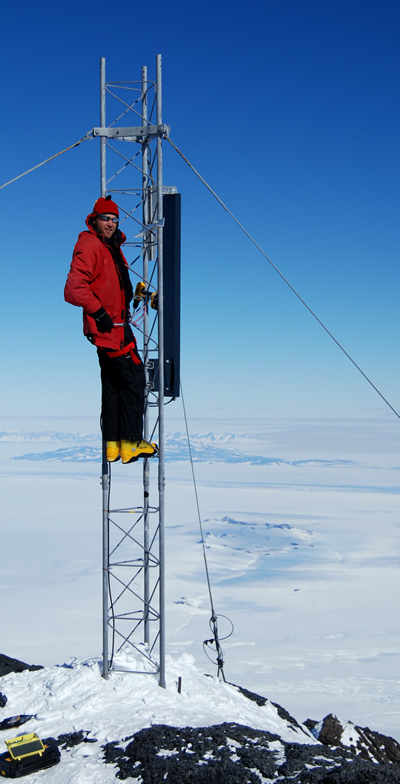 The UNAVCO base system PAL2 uses the same antenna as the USGS base station PALM and provides centimeter level differential corrections to properly equipped users in the vicinity of Palmer Station. Publicly available data are archived at UNAVCO with minimal latency. The new Trimble NetRS receiver is connected directly to the internet, and can be accessed and operated remotely, resulting in a substantial time savings for the Palmer Research Associate. The UNAVCO base is equipped with a real-time kinematic (RTK) GPS base radio. Additionally a second GPS receiver is available at Palmer, which allows for centimeter level surveys in real-time in the immediate vicinity of the station. 3. The permanent station at WAIS Divide Camp continued summer operations during the 2006-2007 season (Figure 3). UNAVCO installed the community GPS base station in November 2005 to support local GPS projects and provide a consistent time series for the duration of the camp. This base station at the camp was used by several science groups during the summer season, including I163 (Raymond) and I171 (Waddington). 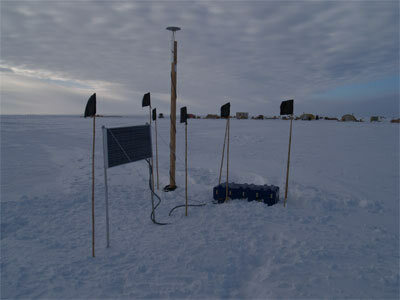 The wireless ethernet link to WAIS camp was upgraded to download data automatically to the computer at the camp. Although it currently functions as a summer-only site, the potential to upgrade it for winter-over operation is available if requested by the WAIS community. Publicly available data from this site are archived at UNAVCO. Figure 1 - Seth White adding a new radio repeater antenna on Truncated Cones. The repeater relays GPS between Cape Roberts/Mt. Fleming and McMurdo. These stations run continuously throughout the whole year. Figure 2 - Base Antenna at Palmer Station.